Anthropology is a kind of debate between human possibilities -- a dialectical movement between the anthropologist as a modern man and the primitive peoples he studies. This brilliant, tough-minded book contains chapters ranging from encounters in the field to essays on the nature of law, schizophrenia and civilization, and the evolution of the work of Claude Levi-Strauss. 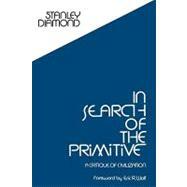 Diamond views the anthropologist who refuses to become a searching critic of his own civilization as not merely irresponsible, but a tool of Western civilization.